All eyes will be on a very important pair of left wrists during Day 1 of the U.S. Open — those belonging to Novak Djokovic and Rafael Nadal. Defending champion Djokovic, a righty, uses his secondary arm for a two-handed backhand. Nadal, of course, is a lefty who relies on that wing for his heavy topspin forehand that is among the best strokes in the game. How each man looks as he begins a bid for a third career title at Flushing Meadows will be one of the main things to watch Monday at the year’s last Grand Slam tournament. The fourth-seeded Nadal, who beat Djokovic in the 2010 and 2013 finals, plays during the day session in Arthur Ashe Stadium against Denis Istomin of Uzbekistan. Nadal has won all four of their previous matchups, taking 10 of 11 sets. Nadal missed 2 1/2 months because of a problem with the tendon sheath in his wrist, pulling out of the French Open before the third round, then skipping Wimbledon altogether. He returned at the Rio de Janeiro Olympics this month, losing to Kei Nishikori in the bronze-medal match in singles and winning a gold medal in doubles with Marc Lopez. The No. 1-seeded Djokovic, who defeated Nadal in the 2011 U.S. Open final and Roger Federer for last year’s title, said his wrist began bothering him shortly before the start of the Rio Games, where he lost in the first round. He then withdrew from the Cincinnati Masters. Djokovic practiced on Ashe on Sunday evening, with coach Boris Becker observing, and seemed to be hitting backhands without a hitch. What really matters is how Djokovic does under the lights Monday night against Jerzy Janowicz of Poland, a 2013 Wimbledon semifinalist whose career has been derailed by injuries and who entered the U.S. Open main draw via a protected ranking. They’ve never played each other. ROOF’S DEBUT: Not that it’s any guarantee, but the forecast does not call for any rain. 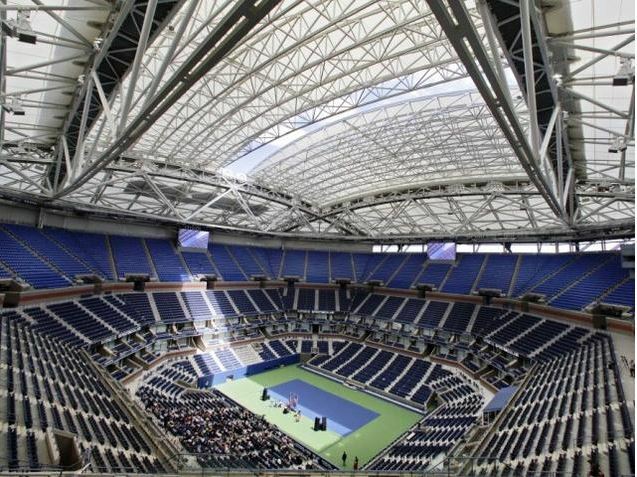 Still, even if the weather is dry, the new $150 million retractable roof atop the tournament’s main arena will make a debut of sorts: The U.S. Tennis Association plans to shut the structure after the day session, then open it while Phil Collins performs “In the Air Tonight” during the opening-night ceremony. American siblings Ryan and Christian Harrison are the first brothers to get into the main draw of a Grand Slam tournament by both qualifying since at least 1982. The 120th-ranked Ryan — at 24, he’s 2 years older than the 694th-ranked Christian — faces France’s 54th-ranked Adrian Mannarino on Monday. Christian is scheduled to play Tuesday. U.S. CONTINGENT: The Harrisons are two of the half-dozen players from the United States who qualified, helping raise the country’s total representation to 39 players (22 women, 17 men), the most in the U.S. Open since there were 40 in 2005. Monday’s schedule includes these all-American matches: No. 8 Madison Keys vs. Alison Riske on Ashe at night, No. 20 John Isner vs. Frances Tiafoe, No. 26 Jack Sock vs. 18-year-old Taylor Fritz, and Madison Brengle vs. Kayla Day. REMEMBER VINCI? : A year ago, Roberta Vinci was ranked 43rd, unseeded at the U.S. Open and author of one of the biggest upsets in tennis history, ending Serena Williams’ bid for a calendar-year Grand Slam by beating her in the semifinals. Seeded No. 7 this time, Italy’s Vinci returns to the site of her only major final, opening play in Ashe on Monday morning against Anna-Lena Friedsam. Following her on that court will be No. 2 Angelique Kerber, the Australian Open champion and Wimbledon runner-up, against Polona Hercog. Kerber is one of three women — Garbine Muguruza and Agnieszka Radwanska are the others — who could replace Williams at No. 1 in the WTA rankings by tournament’s end.